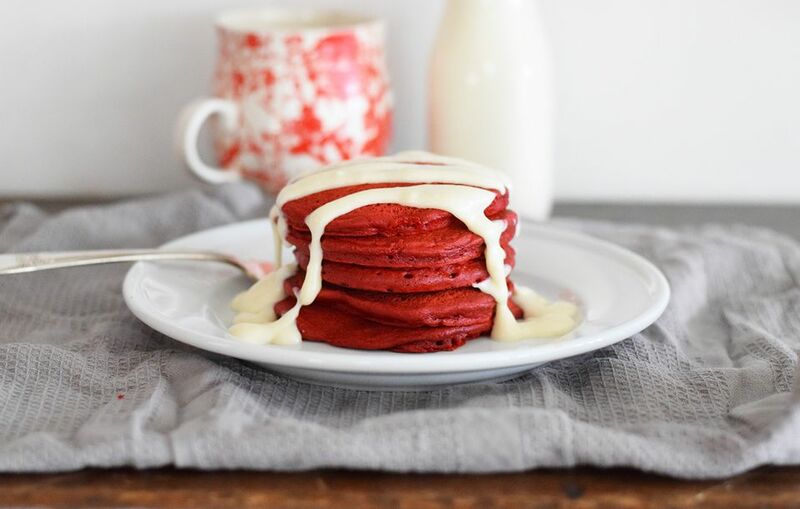 Get creative this Valentine's Day and spoil your hunny with decadent and festive red velvet pancakes. Delicious and colorful, this indulgent meal will look absolutely stunning on a beautiful tray for a special breakfast-in-bed treat. Want to test out your pancake making skills and really wow your special someone? Make the pancakes in heart shapes and top with jumbo heart sprinkles! You can also add a little more decadence to these beauties with a little whipped cream on top. If you want a bit of fresh fruit, we recommend adding a few red fruits - like raspberries or strawberries - to keep with the red and white theme. Not Valentine's Day, but still want to make these bad boys? These pancakes are a great treat for a weekend brunch or Christmas morning. The colors work perfectly for making a Santa-themed breakfast! Serve these delicious pancakes with a side of bacon and some fresh fruit and sit down to enjoy! First, heat a large cast iron griddle (a non-stick pan also works) on high heat. In a large bowl, whisk together the cake mix and the flour until they are combined. In a medium-sized bowl, add the milk. Then whisk in the eggs and melted butter, making sure the butter has cooled slightly so it won't scramble the eggs. Gently and gradually add the wet mixture to the dry mixture, and combine with a whisk until the batter is completely moistened and there are only a few small lumps. Be careful not to over-mix as this will make the pancakes tough instead of fluffy. Turn the griddle's heat down to low. Spray with non-stick spray or grease with butter. Using a ladle or large spoon, spoon about 1/4 cups of batter onto the griddle to create the pancakes. Cook for a few minutes on each side, until fluffy and spongey. Be careful that your heat is not too high. These pancakes can burn easily due to their sugar content. Keep the pancakes warm in a 200 F oven while you whip together the cream cheese icing. In a small bowl, combine the softened cream cheese with the powdered sugar, milk, and vanilla. Beat with a hand mixer for about 2 minutes, or until completely combined. Drizzle the icing over the pancakes and serve with fruit, bacon, or eggs.